Pours, well, amber. A little on the orange side and yet dark. Small tan head that fades quickly to a lacing that completely covers and lasts forever. Smell? Wow. Like, malts. A huge caramel nose - like, hmm, an Eku 28, you know what I mean? Ah. Well, it's not a 10% abv beer so you shouldn't expect it to taste like the Eku... A pleasant amber session ale. Nice and easy on the tongue - no one flavor really shouts anything else down (well, you can just taste the aforementioned malts - but not overly so. Enough to know that they're there). Very very easy to drink... And, hey, it makes a great sorbet, too. Probably because it is so smooth and even... Really, with your buddies in the pub and pitchers of this, well, you're all set! The body is on the lighter side of medium, but with the crisp freshness of the flavor that goes just fine. New to beer tasting, so take this with a grain of salt. SMELL = Honestly, smelled like a foot. Not a ripe, all day while running foot, but maybe like 2-3 hours in a sneaker. Did not like the smell. LOOK = Carmel color with a cream colored head. Not thick. TASTE = Bitter. Could not get too much other taste, but it did have a very slight sweetness at the end. OVERALL = not for someone like me getting away from the mass-produced American beers. This would be for a more veteran taste. 12oz bottle poured into a shaker glass. Love the malty caramel taste. My favorite ale, this is one of those that you can't just have one. The Lays potato chip of beers. It is a dark amber and red ale. It smells like caramel. It smells like a masculine and bitter toffee or candy. It tastes great and sweet and bitter at the same time. It feels relatively light and its a great beer to finish a night. Really hits the spot when you want a true Ale. 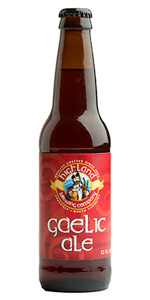 Highlands Brewing is one of the first and their Ale is still one of the finest. Nice blend of malt and hops. With a little lean towards the hops. Curious because Ale wasn't originally brewed with hops. Still, a great tasting Ale that may or may not, be Gaelic. Poured from a 12 oz. freshness stamped bottle: beautiful and clear, deep red with a foamy, beige head that slowly dissipated. The aroma solidly emphasized the malt profile: sweet and malty with some hints of spicy hops. Very nice and refreshing flavor that is well balanced by the cascade hops. The flavor is sweet and slightly fruity with a gentle hop bit at the end. The malt profile never becomes cloying even as the ale warms in the glass. The mouthfeel is soft and silky with a light to medium body. The carbonation is not overpowering yet keeps the ale refreshing and zesty on the palate. While the palate is coated with the malty sweetness, there is a pleasant, lingering bitterness. This ale reminds me why I always enjoy trying the amber ale style; you never know how the brewer will interpret this vague style. This is one of the best. Beautiful, fat-bubbled, deep-ruddy red-amber ale, I find myself unfortunately not as impressed with the remainder of this Highland flagship than I expected to be. It has a very mild, slightly malty odor, but that'd be forgivable if the flavors weren't also so excessively mild. Besides being a bit thin in texture, Gaelic Ale is quite lean on the flavors I expect from a well-crafted amber: the malting is clean, but doesn't do much to make its presence felt besides a bit bite on top of its moderately sweet substructure; and the overall impression is certainly a little less than the "rich malty body" promised on the label. Meanwhile, the hopping is nice, but largely straightforward: not a lot of fragrance or florality, with the Cascade and Willamette primarily serving to ripen the sweetness a bit with some grassy bitter notes. It's a fairly drinkable beer—though I wouldn't quite call it "sessionable," despite its fairly light body, since the sweetness outweighs the crispness, respective to Gaelic's malt elements (and malt is the crucial component of an amber, as far as I'm concerned). But, as stated, it's a little disappointing, given that I've liked other products from Highland, and this is their ur-product. I've been told that on draft it better matches its promises, both in terms of official description and critical profile, but I suppose I'll believe that when I taste it; from the twelve-ounce bottle, it was decent, but underwhelming. Sorry, I just can't rate this as what others have. There is a very off-putting aftertaste with this, perhaps I got a bad bottle? I just don;t get the vive others and the bro's have had. Appearance: Crystal clear amber bodied with a light cream head with a touch of ruby. Aroma/Flavor: Nutty and bready up front with some notes of toffee, and a fruity aroma that doesn't show through quite as bright on the palate. Mouthfeel: Medium bodied with a touch of hop bitterness lingering. Not much, but doesn't compliment well. Such a pleasant surprise. This ale has a dark color I liken to just lighter than coke. Little to no head. The nose is deceiving as it has little to nothing as far as a nose. Taste is all beer with a late caramel hint....very little caramel though. Overall this is a great ale. Appearance - Pours crystal clear and copper in color with an off-white, half finger head. Fair retention, resulting in a thin, broken layer of surface suds. Not much for lacing outside a few minuscule spots. Smell - Aroma hits on a good amount of caramel, with a bit of slightly earthy, slightly fruity character. Taste - Follows the nose. Plenty of caramel that's almost overridden by the hop character that exhibits character of spice, some citrus, slight floral and earth elements. Finishes much the same, but with a bit of toastiness. All in all, a well balanced ale. Mouthfeel - Medium-bodied with fair carbonation. Slightly slick texture with a somewhat dry finish; easy drinker. Overall - A very solid, but not spectacular amber. No real weak points, but it simply doesn't stand out. They say it's their flagship, and that makes sense. It's an easy drinking brew with a flavor profile that should work well enough for most consumers. A= Pours a nice slightly hazy deep amber color with a nice off white sort of tannish head on it that holds steady at a half finger high and leaves some steady lacing. S= The smell is a sort of nutty deep almost caramelly sweetness... No hop aroma and not much deep roast. The smell is sort of unique and not unpleasant. It has a sort of grainy raw mash smell to it. T= The taste is again a very nice sweetness. Little to no hop flavor in it but there is a nice sort of grainy mash taste to it that leaves you wanting more. This is a nice tasting amber that isn't overly hopped. M= A near perfect carbonation. O= This beer is avery well done red ale that isn't the overly hopped variety. This beer has a nice grain flavor and a solid mouth. This is a solid beer that you should seek. Draft pint at Sine Irish Pub at the Pentagon City Mall. Red copper color arrived with 1/2 inch white head. Malty sweet fruit cocktail (candied peach, pear, cherry, and orange) aroma with a kick of grapefruit hops. Fruity taste with grapefruit zest. Remarkable balance of sweet malt and bitter hops. Really enjoyable! Overall: Just so great. One of my favorite American Amber Ales. This is a real amber color. A red hue like peach tea with a slight haze. Dense creamy head that sticks. Has a bright, sweet, mouth-watering smell. Like sweet grapefruit, malty caramel, and a touch of dried apricot. Taste is first a pronounced hop bitterness, fresh and citrusy. Then it rounds quickly to a caramelized malty backbone. An aggressive pour leaves a thick, tan head over a deep orange-red beer. Clear. Aroma is sweet breads and malts, caramels, and a slight citrusy hop presence. Taste begins sweet and smooth. Caramelized malts dominate. Very balanced hop flavors follow shortly after. Leaves the palette sticky. Again, extremely smooth. Malt focused, but enough hops to not overwhelm. Great body. Thick mouthfeel compared to most reds/ambers -- which seems to play better with the malt-centered flavors. Carbonated well. Highly drinkable beer. Certainly one of my go-tos. One of the best locals around. Poured from 12oz bottle. Review from notes. A- Poured amber/orange color. Half finger light tan head that dies down to nothing after a couple seconds. Spot lacing on the sides of the glass. S- Sweet caramel malts in the front end of the aroma. Some light bready malts in middle with some light earthy hops in the back end of the aroma. T- Light oxidation in the front end of this beer. Caramel malts follow after the light oxidation. Bready malts come through in the middle. Muted sweet alcohol taste in the back end of the beer. Also, muted bitter hops in back end but very faded. M- Light mouthfeel. Carbonation good for the style. Light oxidated taste left on the palate with some bready malts left in the aftertaste. Clean tasting other than the light metallic taste in the beginning. D- This was a average drinker which isn't a bad thing. I would gladly buy a sixer of these if they were here. Would recommend as a good intro into craft beers. Bottle thanks to tronraner. Pours a bright and clear amber color with a medium tan head. A sweet nose of rich caramel, some toasted malt and sugars. The flavor is also dominated by loads of caramel malts, some balance is achieved by a decent hop profile. A soft and fizzy mouthfeel. A light bitterness in the finish. Fairly earthy and nice.